In this story that person is a quiet, self-taught Boston audio engineer Stephen B. Fassett (1914-1980), and this article is a preliminary attempt to honor his generative, facilitating and unsung role in the early careers of countless mid-century poets, jazz & blues musicians, and folk music revivalists as they converged on the burgeoning epicenter of 1950s and 60s Cambridge/Boston. I think you’ll be surprised to discover the voices that coalesced in his recording studio on Beacon Hill—and emanated far beyond it. In order to tell this story, I first need to situate us in the Woodberry Poetry Room, circa 1950. Unattributed image of Ezra Pound in the Poetry Room. Were undergrads really queuing up to get an earful of Prof. Frederick C. Packard’s (albeit first) poetry recordings of T. S. Eliot and Ezra Pound? Two recent surveys of the Poetry Room’s audio collection have suggested to my mind one additional explanation for this extreme spike in the listening census. Thousands of students were listening to discs in our collection, but those discs didn’t all feature contemporary poets. 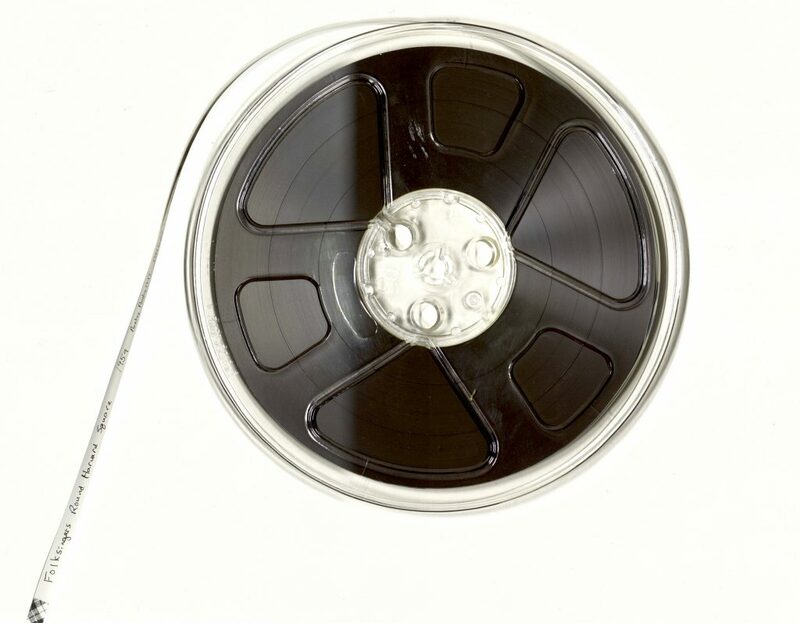 In fact, we’re beginning to realize that discs created, copied, or collected by Packard for his “vocarium” (or, “library of voices”) and deposited in the Poetry Room for playback and preservation included everything from surgeries to Shakespeare, Haitian-Creole ritual performances to Japanese-language lessons, experimental radio plays to Scottish border-ballads. 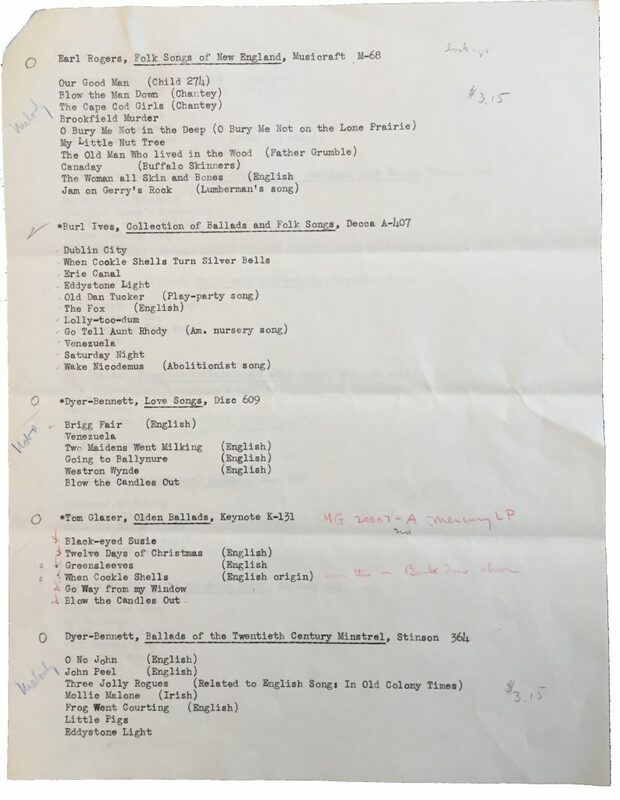 In addition to the pioneering poetry-specific discs that Packard made (among them, the earliest recordings of T. S. Eliot, Robert Lowell, Elizabeth Bishop, Tennessee Williams, Vladimir Nabokov, Marianne Moore, etc. ), these surveys have revealed a curious predilection for collecting and recording folk music. As a part of his in-room use “vocarium,” Packard recorded English balladeer Richard Dyer-Bennett (“Performance of Traditional Folksongs” (1941); Brenda Engel performing “Mexican Songs with Guitar” (1941); Sara Allgood singing “Irish folksongs” (1948); and his wife Alice Mansur Packard performing “Traditional Border Ballads” (1949), a field in which she was a specialist. Their self-declared curatorial scope—words spoken and sung words—was a veritable dragnet of all available spoken-word and folk music recordings at that time. 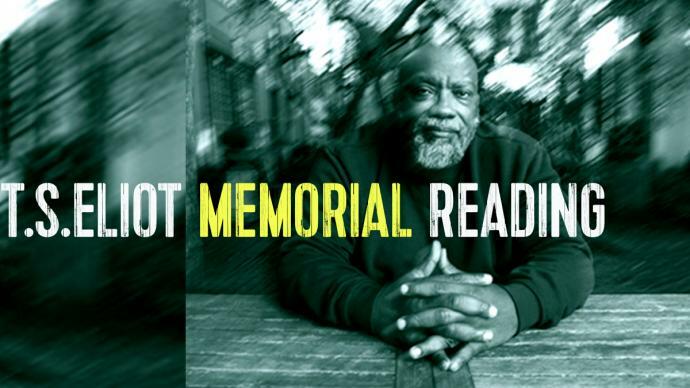 “For about two years after I got to Harvard, I had been doing nothing but working…. And I was getting really sick of it, and I didn’t quite know how sick of it I was getting. But I discovered in the Lamont Library that they had this room, the Woodberry Music and Poetry Listening Room [sic], and they had a bunch of folk music records, and I just stumbled across somebody called Leadbelly…. Charles River Valley Boys at Club 47 (circa 1960). Bob Siggins, Eric Sackheim, Ethan Signer & Clay Jackson. Published in Baby, Let Me Follow You Down (Anchor Books, 1979). 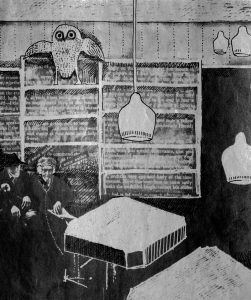 Throughout the 1950s, the Poetry Room and the adjacent Forum Room were, according to Packard, “the epicenter” of aural activity on campus. Harvard professor and pioneering ballad collector Francis James Child (who aggregated and transcribed over 300 ballads in the 1880s) has often been cited by Eric Von Schmidt  and Joan Baez as one of the early print resources for the ballads they performed. Whether the Poetry Room played a local LOC-style role in this additional dimension of transmission is uncertain. 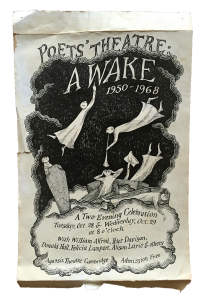 But, as I began to follow the Poetry Room discs to their next destination, I encountered a far more direct and definitive relationship between the Poetry Room and the converging communities of poetic innovators and folk musicians in that era. Enter Stephen Fassett, stage left. 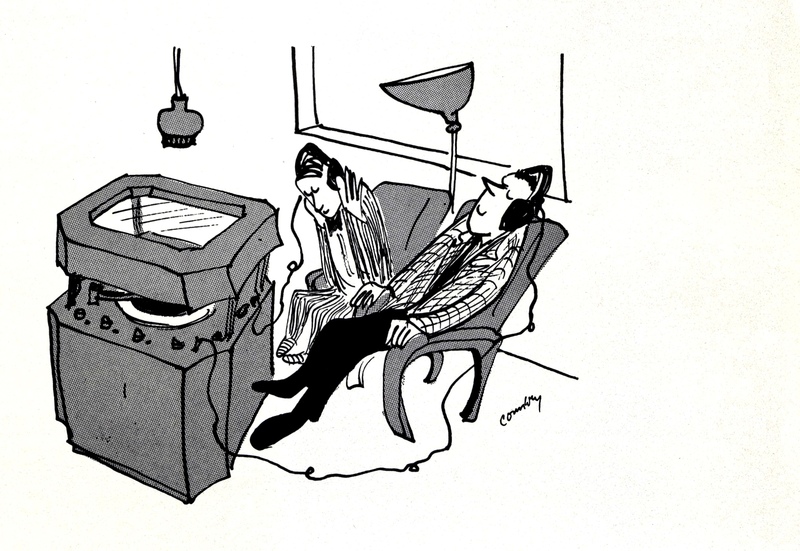 As the grooves on the listening copies—for poetry and music alike—began to wear out due to over-use, Sweeney and Packard started to partner with engineers beyond Harvard to transfer the discs to the new reel-to-reel format and to begin making recordings directly onto magnetic tape. After a few years with Telavix and Transradio studios, they appear to have found the expertise they were looking for in musicologist and audio engineer Stephen (“Steve”) Fassett. By all accounts, Stephen Fassett already had a stellar reputation and a very full dance-card. 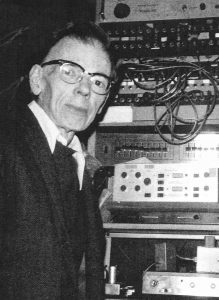 A self-taught audio engineer, who began avidly collecting records as a teen (when, due to rheumatic fever, he was bedridden and confined to a wheelchair), Fassett translated his industrious energy and idiosyncratic passion into a radio gig at WQXR/New York in the 1940s. After marrying Béla Bartók scholar Agatha Illes in 1947, he moved to Boston where he created a multi-level recording studio in his brownstone at 24 Chestnut Street in Beacon Hill. By 1954, he was advertising in the Boston Symphony Orchestra classifieds: “Fassett Recording Studio: High Quality Tape and Disc Recordings Made in an Unique Atmosphere of Privacy and Comfort.” Loyalty and Commitment might well have been additional adjectives on that list. 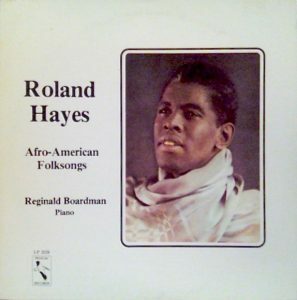 Roland Hayes compilation, published in 1983. That same year, he began a 25-year-long project of recording and editing the works of African-American tenor Roland Hayes, a singer who has been credited with “shattering the color barrier in the world of classical music” and a musicologist who was crucial in preserving and arranging Afro-American folksongs. 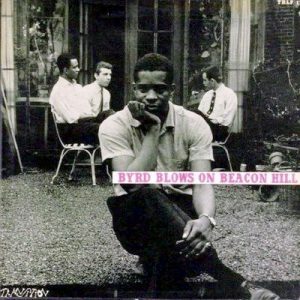 Donald Byrd album, recorded by Fassett in 1956. Clearly Fassett didn’t lack for activity—so why did he begin to add poetry to his repertoire of recordings? According to his widow Kitty Fassett, with whom I spoke for this article, “the love of music, poetry, and literature was in Steve’s genes. He got it from his father, Jay Fassett,” an actor best known for originating the role of Dr. Gibb in Thornton Wilder’s Our Town on Broadway. How Sweeney and Fassett first encountered one another isn’t known. It’s very possible that Sweeney (who resided at 51 Beacon Street) knew Fassett from his social circles on Beacon Hill. Fassett was also a recordist of live readings at Harvard’s Sanders Theater and MIT’s Kresge Hall in the mid-1950s, as well as the sound engineer—eventually—for folk impressario Joe Berk and his Pathways of Sound/Credo records (located at 102 Mt. Auburn Street in Cambridge). 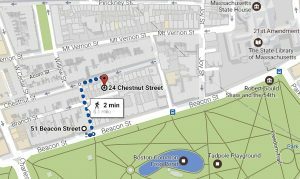 The distance from Jack Sweeney’s apartment to Stephen Fassett’s recording studio. A Poetry Room invoice suggests that recent transplant Ted Hughes recorded for Fassett that year. And, W. S. Merwin also made his earliest extant recording at Fassett’s studio in 1957, while on a Ford Foundation fellowship in Cambridge with the Poets’ Theatre. (Much like Club 47, the Poets’ Theatre—founded in 1951—was actively bringing together performances of poetry and folk music.) Merwin and Fassett became lifelong friends. The poet even stored his furniture with Fassett when he went abroad and had to (humorously) reject Steve and Agatha’s frequent offers of funds. Merwin writes in a Jan. 1960 letter: “I toled you once I toled you twise I do not want yore money.” As a sincere token of his affection for them, the poet dedicated the poem “Native Island” to Steve and Agatha—a poem which was subsequently selected for inclusion in Sylvia Plath‘s American Poetry Now. Typescript of W. S. Merwin’s “The Native” (1958), with dedication to the Fassetts. Courtesy of the Woodberry Poetry Room, Harvard University. By the summer of 1958 things had truly heated up, and the generative interchanges between Sweeney and Fassett began to multiply. 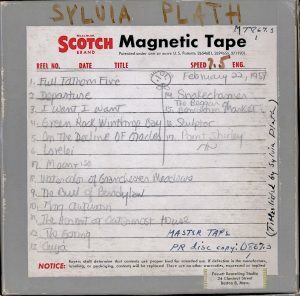 On Feb. 22, 1959, Plath returned to Fassett’s studio to make her second recording, which features many poems (and audible drafts) of the poems that would appear in her first book, The Colossus (1960). PS3566.L27 A6 1959x. Woodberry Poetry Room, Houghton Library, Harvard University. In May 1959—three months following Plath’s last recording at Fassett’s—the same Chestnut Street studio hosted an 18-year-old singer then living in Belmont, Mass. : Joan Baez. The recording was precipitated in part by her momentous premiere at Club 47 the year before. M1629 .F65 1959x. Courtesy of the Woodberry Poetry Room, Harvard University. The album that emerged from the Fassett recording session, Folksingers ‘round Harvard Square (Veritas Records, 1959), featured a range of folk ballads—some of which were never released again until the 2011 album, The Debut Album Plus: Joan Baez. Shortly after Folksingers publication, “a poster appeared on telephone poles and store windows around Harvard Square. It pictured an intense young girl in full song emerging from a background of forest-green ink. It announced to anyone who could decipher the calligraphy that the club Mt. Auburn 47 … was presenting ‘A NEW SUMMER PROGRAM/tuesdays/AN Evening of Folk Music with JOAN BAEZ” and with this “the tide had turned” . 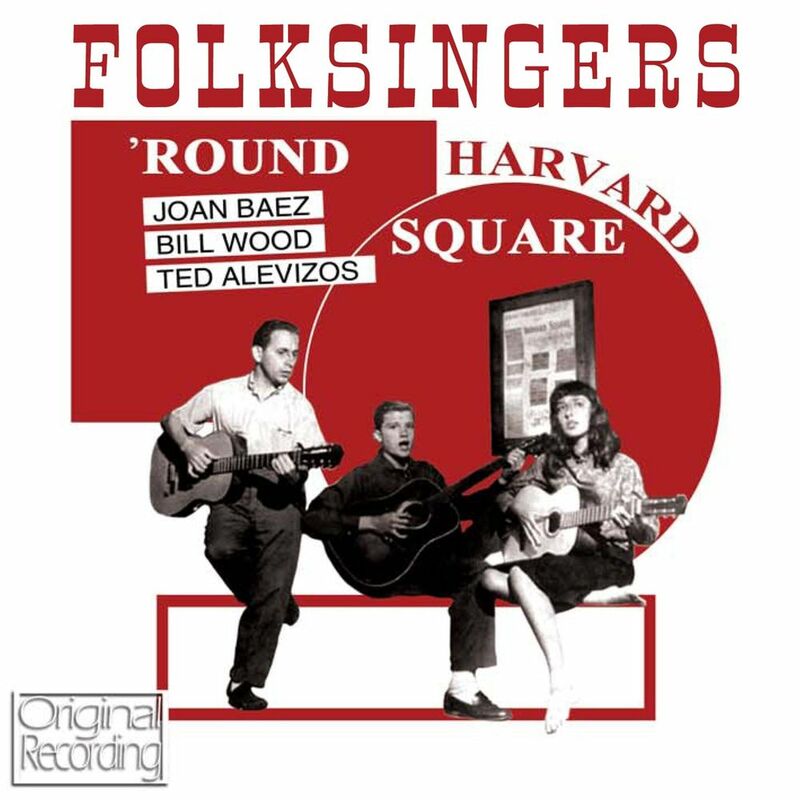 Folksingers ’round Harvard Square (Veritas Records, 1959). Throughout the 1960s, until shortly after the end of Sweeney’s tenure at the Poetry Room, Fassett’s poetry recordings also continued in earnest. 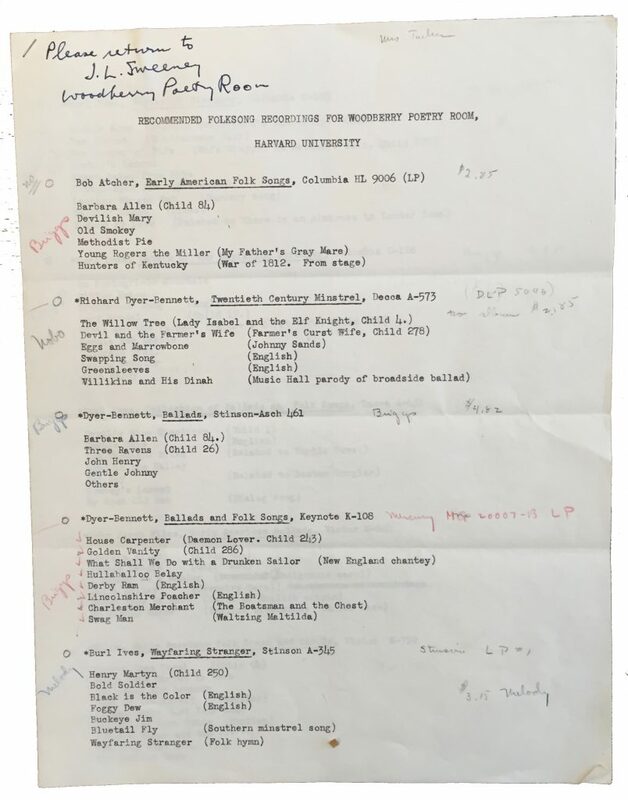 Together Sweeney and Fassett created a viva voce time-capsule, an “archive of the mouth,” with recordings by: Anne Sexton (Dec. 8, 1959, and May 9, 1960), Denise Levertov (April 14, 1960), Robert Bly (March 6, 1961), Yvegeny Yevtushenko (May 18, 1961), John Wieners (March 29, 1962), William Everson (Feb. 16, 1963, and Nov. 6, 1965), Allen Ginsberg (Nov. 14, 1964), Robert Creeley (Oct. 23, 1964), Louis Zukofsky (Dec. 15, 1963), Jean Valentine (April 1965), Stephen Jonas (July 15, 1969), John Koethe (May 20, 1970), and Audre Lorde (May 15, 1970) to name but a few. PS3537.E915.A6 1959x. Courtesy of the Woodberry Poetry Room, Harvard University. As the vital and violent decade of the 1960s drew to a close, and the folk music scene gradually outgrew the café-style intimacy that had been cultivated at Club 47, the club closed in April 1968 (subsequently reopening as Cafe Passim) and Sweeney retired from the Poetry Room in 1969. But Sweeney’s correspondence with Fassett remained steadfast until the latter passed away in 1980. While it risks every kind of fallacy to try to find resonances between the Cambridge-Boston folk music revival and the kaleidoscopically diverse poetry being recorded and fostered at Fassett’s studio, I thought it would be fun to close by floating the question to two poets: Katie Peterson and Fanny Howe, who kindly took me up on it. “I always think of the ballad aesthetics of the folk revival, those stories rewritten in more casual key by Dylan and Baez and others, as staging a confrontation between the individual and culture in which both are necessary forces. I think of the ballad conventions that Dylan saw insightfully inside his own life and the lives of others, and I am reminded that his goal wasn’t self-expression really but the dramatization of this conflict. “The development of recording and taping (like the hand-held camera) was what made all these connections possible between folk and poetry, going out to the countryside to find the old traditional songs and singers, being able to listen to them back at home was utterly new…. I think protests were fueled by the return to the raw past, Pete Seeger and country singers like Johnny Cash and his plain guitar brought into Folsom prison, where it could be actually recorded. END NOTES: I want to thank Kitty Fassett for her instrumental assistance with this article, and W.S. Merwin, Lynne Sharon Schwartz and Tom Rush for their swift and generous responses to my email inquiries. I would also like to express my gratitude to all of the audio engineers we have worked with at the Poetry Room to continue this vital recording tradition: in particular the exceptional team at Harvard’s Media Production Center (Gerald MacDonald, Kevin McGowan, and Anthony DiBartolo). I would also like to acknowledge the poet Peter Gizzi whose phrase, “archive of the mouth,” helped inspire this blog post. As with every article I write, this piece is intended to initiate research and to elicit additional information. Please feel free to use the “Comments” section below to share your own stories of Stephen Fassett or to correct any facts I may have gotten wrong. Frederick C. Packard, Jr. “Harvard Vocarium Has Attained Full Stature,” Library Journal (Vol. 75, No. 2, Jan. 15, 1950), 70. John L. Sweeney describes one of their collecting foci as “sung poetry, the folk ballad.” The Harvard Librarian, Vol. 3, No. 8 (May 1964), 4. Travis Ingham describes the original Poetry Room in Widener Library as being a “sanctum” dedicated to modern poetry, essentially “barred to faculty”—a “library of current verse [….] not books the professors think their students ought to read [but] the books the young men wish to read.” The Boston Herald (June 12, 1931). Eric Von Schmidt and Jim Rooney, Baby, Let Me Follow You Down (Anchor Books, 1979), 28. Baby, Let Me Follow You Down, 33. Baby, Let Me Follow You Down, 30. Library Journal (Jan. 15, 1950), 70. Letter from John L. Sweeney to Alton C. Morris (June 6, 1950). Woodberry Poetry Room records, MS2000-0013, Houghton Library, Harvard University. 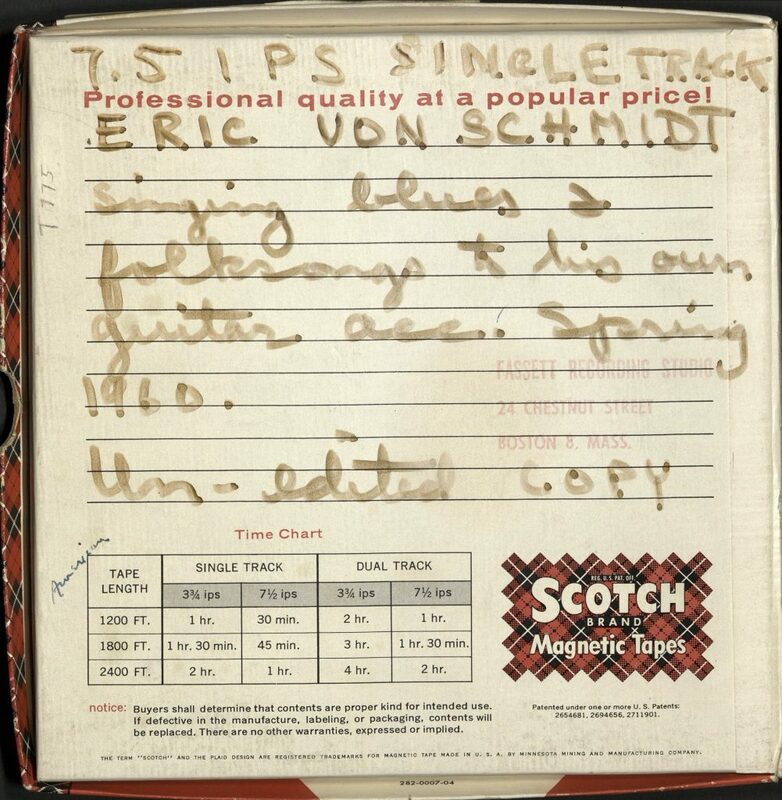 Bob Dylan, who recalls meeting Von Schmidt “in the green pastures of Harvard,” considered Von Schmidt and his work to be an early “password.” Permission to share Eric Von Schmidt’s Fassett recording (later in this post) was generously granted by Caitlin Von Schmidt. For the Love of Music: The Club 47 Folk Revival (Ezzie Films, 2013). 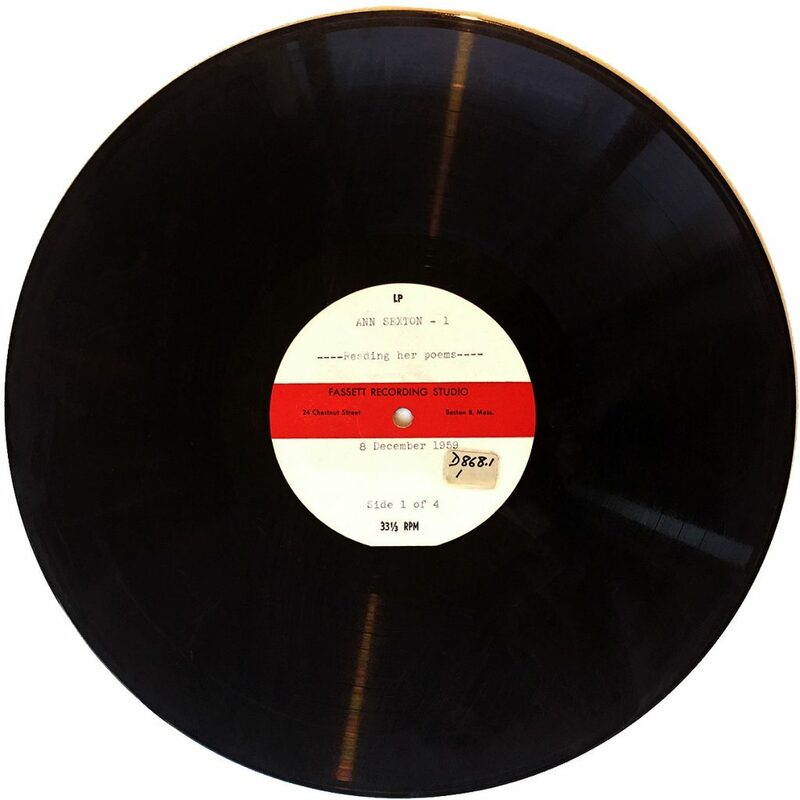 After Harvard College Library withdrew from the commercial aspects of the Harvard Vocarium record label in 1955, the bulk of the recordings created by the Poetry Room were overseen by Sweeney and his successors. Packard continued to actively record on his own Vocarium label, though, up to and including his retirement from the University in 1966. Sylvia Plath, Letters Home: Correspondence 1950-1963 (Harper & Row, 1975), 331. Fassett writes to Sweeney: “The poem read for us that time, in my basement workroom rather than up in the studio,—the one different from the printed version in Life Studies was ‘My Last Afternoon with Uncle Devereux Winslow’ a marvelous reading which includes some lines he cut before it was printed. He gave me permission to keep a copy of the original of that tape….” (July 15, 1977, from the Papers of John L. Sweeney, University College Dublin, LA52/119). Unabridged Journals of Sylvia Plath (March 14, 1958) 351-52. As several scholars have noted, Plath does somewhat mysteriously mention making a recording for Fassett as early as 1957. No material evidence exists to substantiate that this recording session occurred. 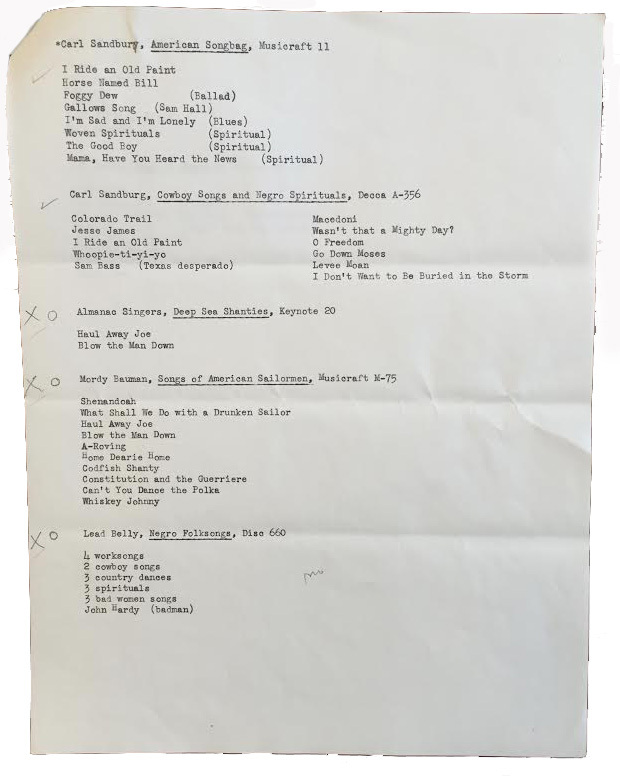 Fassett’s 1957 recording session with Ted Hughes is noted in an invoice sent to Sweeney—Plath’s, on the other hand, is not. That said, in 1958 the couple did record on the same date: so it’s very possible that they did so in 1957 as well. Letter from Ted Hughes to John L. Sweeney (May 11, 1958), with annotations by JLS for Stephen Fassett. Papers of John L. Sweeney, University College Dublin, LA52/119. Letter from Ted Hughes to John L. Sweeney (June 14, 1958). Papers of John L. Sweeney, University College Dublin, LA52/166. Letter from John L. Sweeney to Stephen Fassett (July 27, 1961). This letter is currently being processed as a part of the Stephen B. Fassett Correspondence at the Woodberry Poetry Room, Harvard University, generously donated by Kitty Fassett. Joan Baez, And a Voice to Sing With: A Memoir (Simon & Schuster, 1987), 57. Ted Alevizos would later serve as the head of Lamont Library and assist in arranging recording sessions for the Poetry Room, when Sweeney spent his summers in Ireland and after his retirement in 1969. A specialist in Greek folk music and poetry, Alevizos was instrumental in recording Greek folksongs for the collection and in commissioning recordings by George Seferis, Lawrence Durrell, as well as the hermit poet Robert Lax on Patmos Island. Email correspondence between Kitty Fassett and Christina Davis (May 10, 2017). Baby, Let Me Follow You Down, 45. Email correspondence between Tom Rush and Christina Davis (May 22, 2017). Letter from John L. Sweeney to Stephen Fassett (Sept. 1, 1969). Courtesy of the Woodberry Poetry Room, Harvard University. Letter from John L. Sweeney to Stephen Fassett (Oct. 23, 1976). Courtesy of the Woodberry Poetry Room, Harvard University. As an endnote to the footnotes, I thought I would add a brief tale about Pete Seeger that connects various dots in our narrative. In 1949, the year that the Poetry Room opened in Lamont Library, Pete Seeger, ’40, formed The Weavers, a group that popularized/revived arrangements of Lead Belly and Woody Guthrie, among others. 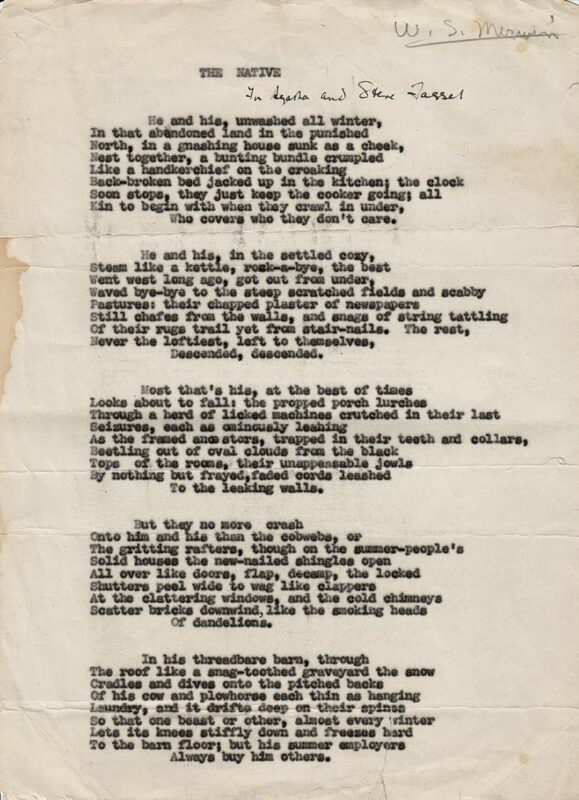 After being brought up on contempt of Congress charges in the mid-1950s, Seeger and his work went underground. He began to earn a living by traveling to college campuses and smaller venues (like Club 47). Tagged with: "charles river valley boys", "clay jackson", "club 47", "eric von sackheim", "fassett recording studio", "Jack Sweeney", "joan baez", "poets' theatre", "roland hayes", "stephen fassett", "steve fassett", "sylvia plath", "ted alevizos", "tom rush", "vocarium", "w. s. merwin"